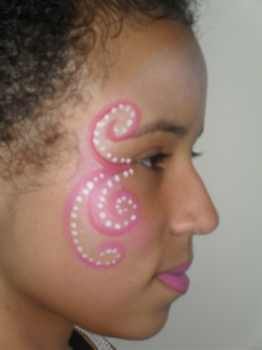 The coolestprincess face painting ideas are here for you to look at also get some free face painting ideas. I'm sure I don't have to tell you how much FUN kids have with these kind of toddler activities. 1. To start with use a silver/white shimmer base paint. Don't apply too much paint just a light coat. Then add a pink base coat on to the cheeks. Again just a light coat to give a little bit of highlight. 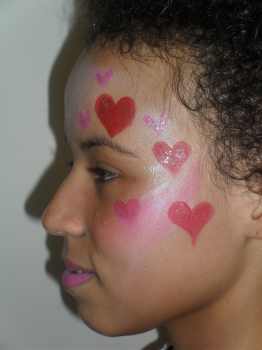 Then add hearts of various sizes to one side of the face. Use red and pink paints to add interest. 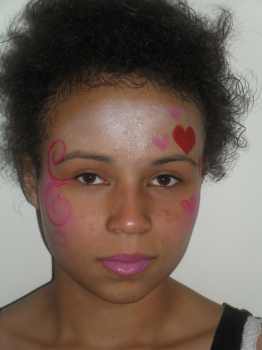 Next add some simple swirls in pink to other side of the face from the hearts. About 3 or 4 swirls will do. Next add some highlight to the swirls by adding white dots as in the picture. This really lifts the design and accentuates the swirls. Now to finish off you can add some glitter paint to the hearts. Just lightly paint over each heart to add some sparkle. Just a quick side view of the swirls in all their glory. Another side view of the hearts with a touch of glitter. I nearly forgot to say to finally finish this design paint the lips in bright pink. 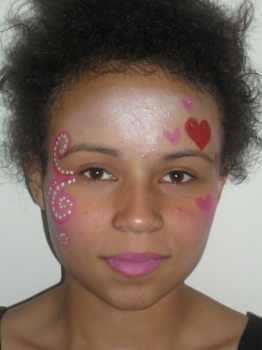 You can print of a princess face painting template here as a pdf. It saves having to print the whole of this webpage. If your looking for more face painting ideas then this video below shows you how to face paint a winter princess.